Tropical Storm Gordon is “not a threat to Bermuda”, the Bermuda Weather Service said, with its closest point of approach to Bermuda within 72 hours having passed. 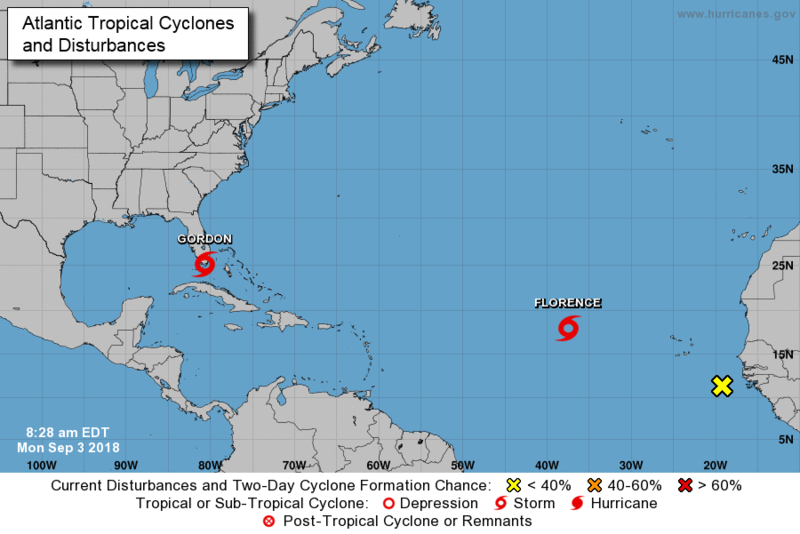 Gordon is the seventh named storm of the 2018 Atlantic Hurricane Season, and the second Tropical Storm currently swirling in the Atlantic, joining Tropical Storm Florence. 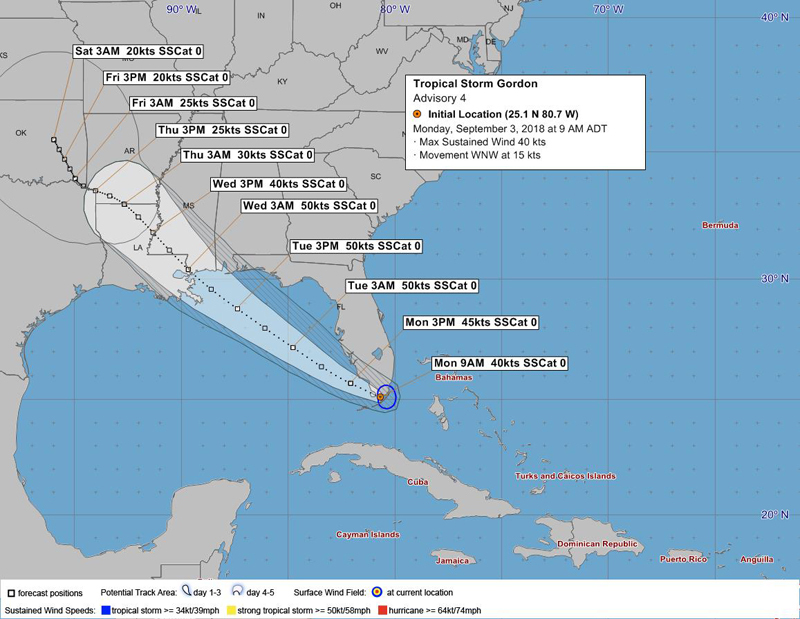 The latest forecast from the U.S. National Hurricane Center said, “Gordon is moving toward the west-northwest near 17 mph [28 km/h] and a west-northwestward to northwestward motion is expected over the next 72 hours. 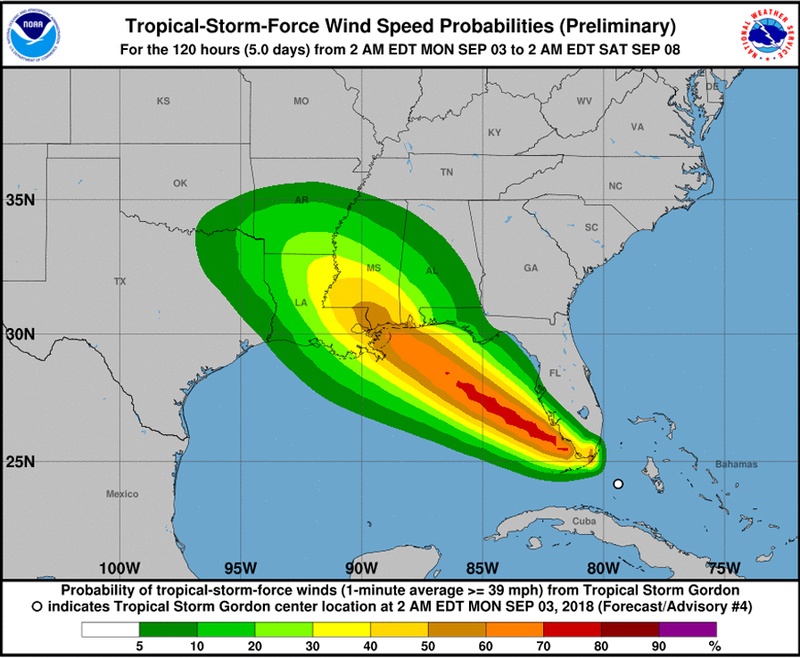 “On the forecast track, the center of Gordon will pass over the southern tip of the Florida peninsula this morning, move over the southeastern Gulf of Mexico this afternoon and evening, and reach the warning area along the central Gulf Coast by late Tuesday or Tuesday night. FRIDGE: LIGHT: AND : WATER. AFTER THE HURRICAN HAS PASSED . ALL TWO PERSON JOBS FOR SAFETY REASONS. The new modern day fridges use the forsed air principal like an air conditioner does. Plan “B” forget trying to save the food. Plan “A” Go back some 80 years . When the power goes off the modern day fridge will no longer function. Fill containers with water , and freeze it to make ice blocks these ice blocks will hold the fridge and deep freeze for a while . We use empty clorox bottles to make ice blocks in the deep freeze,weeks ahead of time . You should also be storing sealed fresh drinking water in clean bottles store in a dark place say in the lower sexction of kitchen cabinets. Where are you going to store 30 gallons of gas ? You don’t need a gas guzzeling 5 kw power generator as a 2 kw generator will do but not power a house water pump. Check the generator oil often : as generators burn lots of oil. Gas consumption : up to one gallon gas per hour. MACGIVER >>>>>>> Hook generator up to a 15 amp submersible sump pump to pump water from the tank , run a garden hose from the pump to the bath tub or go back to the bucket which is much safer. Fill the bath tub with water for flushing. One light bulb is all you really need. Don not forget to attach a ground wire to the generator run it to a ground rod if not you are asking for trouble. park the generator down wind of your house not on the porch. Carbon monoxide can kill. You car head lignts are the worlds biggest portable flash lilght, also keep the car engine running. a motor cycle will do the same thing watch out for vehicle over heating. Go back 80 years >>>>>>>>.Get every thing done between sun rise and sun set. Never leave things to the last minute.